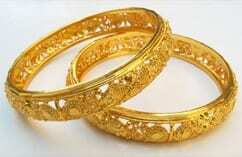 On this page, you’ll find the latest market prices of Gold, Silver, and other precious metals. The handy table provided below displays the most up to date gold, silver, platinum, and palladium prices in. The prices reflected in the table are in Canadian dollars, and are auto updated every 15 minutes from Monday-Friday (excluding public holidays, or other days markets are closed). As precious metal prices are volatile, they fluctuate constantly. The prices below are merely a snapshot of the prices at the time indicated in the table. This pricing data is pulled from a number of 3rd party data feeds, and should be used for reference only. Pinto Gold is not responsible for the accuracy of the precious metal prices in the table below. Naturally, the in house team of appraisal experts at Pinto Cash For Gold does take these latest market prices into account when appraising your gold, jewellery, or high end watches. There are many economic factors that can affect the market prices of gold and other precious metals. Supply and demand, economic data outlook, the US dollar, and inflation are just a few top line factors and influencers that can impact the market prices of these precious metals. Though gold prices specifically do tend to fluctuate over time, it’s not that uncommon, and nothing to be concerned about. As with any investment, this type of volatility is to be expected. Currently, gold prices are generally trending at an all time high, so what better time to sell your old, unworn gold jewellery or other precious metals than now! Pinto Cash For Gold and Jewellery Buyers are foremost experts in gold and jewellery buying in The Greater Toronto Area. Our appraisers have over two generations of experience in the gold and precious metals industry, so you can be sure you’re gold, silver, or other items are in the hands of a knowledgeable expert. Contact us online for more information. Or better yet, stop by our store front at 2490 Yonge street today! We’re conveniently accessible via the TTC on the Yonge-University subway line, near the intersection of Yonge and Eglinton.